Northwest Iowa — Saturday is the first of two National Prescription Drug Take-Back Days for 2019. Many sheriffs’ offices in the area and several pharmacies participate. Sioux County Sheriff’s Deputy Stan Oostra tells us about the program. He tells us why you should get rid of old medications. Other experts have also noted that old medication may not be as effective as a new dose. Oostra tells us that they take almost any kind of drug or medication, but one thing they do not take is needles. (He says many hospitals will accept needles if you put them in a proper container. Contact the hospitals for more information.) Oostra says you can even drop off illicit substances and illegal drugs in the sheriff’s office drop box, no questions asked. He tells us how they’d like you to dispose of what you’re dropping off. 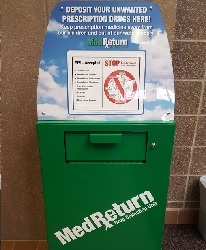 While there is a focus on dropping off your drugs and medications on Saturday, Oostra says the reception box is available 24/7, 365 in the lobby of the sheriff’s office in Orange City. Several pharmacies and hospitals also have drop off boxes. Ask a pharmacist or medical provider for more information. Or click here. Northwest Iowa — Last week the Iowa State Patrol, along with county deputies, and local police officers from six Midwest states conducted a special traffic enforcement campaign. The enforcement effort was primarily designed to take drivers off the road who had been impaired by marijuana. The effort was called the 4/20 campaign, and was held the 19th and 20th of April. 4/20 is the unofficial national holiday for marijuana users. Iowa State Patrol Trooper Nick Erdmann says the northwestern eight counties in Iowa, O’Brien, Sioux, Lyon, Osceola, Dickinson, Emmet, Palo Alto and Clay comprise Iowa State Patrol District 6. Erdmann talks about the results of the 4/20 enforcement effort in District 6. Trooper Erdmann says there was one drug arrest in District 6. According to Erdmann there were a lot of tickets issued during the two-day enforcement period. Taking a look at the statewide numbers, he says there were several OWI arrests by troopers across the state during the period. He says troopers across the state issued a lot of tickets during the enforcement period. Of those 2,275 tickets issued statewide, 1,371, or more than half, were for speeding. Erdmann says there were quite a few people statewide ticketed for not wearing their seat belts, as well. Trooper Erdmann says he considers the enforcement effort to be a success. Trooper Erdmann is the Iowa State Patrol Public Resource Officer for the Patrol’s District 6, which is headquartered in Spencer. Statewide Iowa — Iowa has become the 6th state in the country to offer state government information through “smart speakers.” People may now reference the “State of Iowa” as they ask their Amazon “Alexa” or Google “Echo” some common questions, like how to get a birth certificate or replacement driver’s license. Lieutenant Governor Adam Gregg says nearly half of all the adults in the U.S. use voice assistants to interact with their mobile devices. Jeff Franklin, the chief information officer for the State of Iowa, says the state hired a private company called “Webspec Design” to develop the template for this project. State agencies identified more than 200 questions often asked by citizens. Those questions are now part of the “Ask the State of Iowa” database accessible by smart speaker. George, Iowa — A family dispute in George is keeping Lyon County Sheriff’s Deputies busy. That’s from Lyon County Sheriff Stewart Vander Stoep. He says from the sheriff’s office’s standpoint, the current dispute started On Sunday, April 21, 2019, when the Lyon County Sheriff’s Office was dispatched to a call in George, about 10:20 p.m., for a fight in the Casey’s Parking lot. They report that when they arrived, some of the suspects had left the scene. Deputies report that 35-year-old Ionsina Lewi and 24-year-old Sercy Sandy, both of George were arrested and charged with Disorderly Conduct. They were both transported to the Lyon County Jail. They tell us that a suspect in that crime had left the scene and officers were lead to 219 East Iowa Avenue in George to try and locate the suspect. When they got there officers tell us they located a male inside a vehicle consuming a controlled substance. He was identified as 24-year-old Moner Lewi of George. Lewi was placed under arrest for misdemeanor possession of a controlled substance, and possession of drug paraphernalia, and was transported to the Lyon County Jail. Then on Monday, shortly after 2 p.m., they tell us officers were called to 209 East Michigan Avenue in George for a fight. When they got there, they found the suspects had left the scene. Deputies located the suspects. Arrested were 24-year-old Kitana Lewi, who was charged with 2 counts of Disorderly Conduct and Trespassing; 52-year-old Bilo Lewi, who was charged with Disorderly Conduct, Trespassing, and Criminal Mischief 4th Degree; 21-year-old Vita Kesia, who was charged with Disorderly Conduct, and 36-year-old Caroleen Candido, who was charged with Disorderly Conduct and Trespassing. They report that 24-year-old Sercy Sandy was charged with Harassment. They were all transported to the Lyon County Jail on the misdemeanor offenses. Orange City, Iowa — The final “End It! For Autumn Color Run” is coming up this weekend in Orange City — and the “it” we’re talking about is child abuse. The fourth and final annual event is this Saturday, April 27th. It’s a benefit for Camp Autumn, a therapeutic camp for kids in northwest Iowa, created through Autumn’s Center at Seasons Center for Behavioral Health in Spencer. Seasons Center officials say Autumn’s Center is a regional children’s center serving northwest Iowa children and their families. Autumn’s Center was named in honor and memory of Autumn Elgersma, of Orange City who died on October 31, 2013 after being hospitalized for two days due to the abuse she endured while in the care of her babysitter. One of the organizers of the event, Cindy Cleveringa tells us more about it. She says after careful and prayerful thought, Autumn’s parents and those organizing the run have decided that this will be the last run. She says you can register online, but they’ll even take in-person registration up until the time of the event. According to Cleveringa, it’s a fun run, in which colored powder is dropped on the runners, making pretty patterns on their clothing. She gives us some suggestions. She says there will be a bypass lane if you don’t want your small children to get the color powder on them. Cleveringa says she wants to thank all the sponsors and others who have made the color runs possible over the years. For more information and the registration link, click here. Statewide Iowa — The ACLU of Iowa is challenging the latest version of the state law that seeks to prevent people from going undercover at livestock production or packing facilities. A federal judge ruled in favor of the group in its lawsuit against the first version of the so-called “ag-gag” law. ACLU Iowa legal director, Rita Bettis Austen, says the new law is just slightly different than the first. She says the new law has the same issue as the old one. The harm referred to is the harm to a businesses reputation or economic harm caused by the reaction to the things revealed by undercover investigations. The second law was signed by Governor Kim Reynolds on March 14th. Austen says this law’s limited scope also makes it illegal. A state lawmaker said during debate that the new law was based on an Idaho law that withstood a legal challenge. Austen says that is not correct. She says the one area of the law that can stand is the portion that prevents someone from harming someone at a business or doing physical damage to a facility. The first law is on hold while the state appeals the ruling. The second law went into effect as soon as the governor signed it, but Austen says they will also seek an injunction against it while the case is heard. Des Moines, Iowa — (RI) — Governor Kim Reynolds is giving few hints about her views on legalized sports betting. Monday night, the Iowa House gave final legislative approval to a bill that would let the state’s casinos take bets on professional and college sports — either at the casinos or elsewhere via a smart-phone app. The formal copy of the bill has not reached the governor’s office yet. If she receives it WHILE THE LEGISLATURE IS IN SESSION, she’ll have three days to sign or veto it. After the legislature concludes, Iowa governors have 30 days to review all bills. 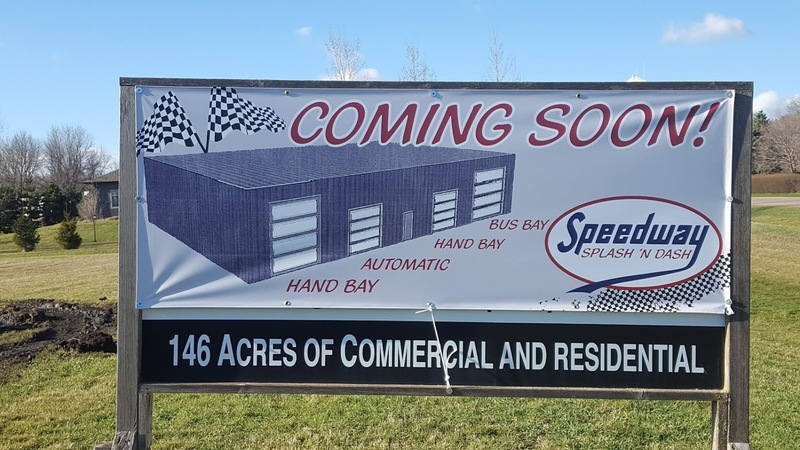 Rock Rapids, Iowa — Two new businesses appear to be coming to Rock Rapids. According to Paula Spykerboer, owner of Spikes Barber and Beauty, she has sold her building — but not her business. She says they’ll be moving into a home at 1402 South Tama, where she will be moving her shop. Spykerboer says she has sold her downtown building to a company who wants to put a brewery in that location. The changes are scheduled for July first. According to Spykerboer, nothing will change about her hair styling business, except the location. She’ll still take walk-ins or appointments, and her hours will not change. Hours are Monday 8 to 5, Tuesday 11 to 7, Wednesday 8 to 5, Thursday 8 to 7, and Saturday 8 to 11. 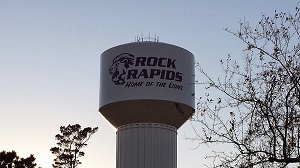 Rock Rapids, Iowa — The Rock Rapids City Council met in regular session on Monday night, April 22nd. The bridge on North Union Street, over Moon Creek is being closed this week, after a delay. The finishing up of the Story Street project on the two blocks south of Rexall will resume soon, pending weather. There are lights to install and sidewalk to finish. The City and Central Lyon are doing a softball field construction project at Borman Forster Fields. It looks like one of the soccer fields will be moved to accommodate the new softball field. Northwest Iowa Community College students will be doing some of the dirt work, and that too is scheduled to begin when weather is favorable. The council voted to proceed with a micro-surfacing project. Lyon County is contracting for micro-surfacing on 160th Street from the city limits, west past Jansma Cattle Company. They asked the city if they’d like to have South Twelfth Avenue micro-surfaced as well since the crew would be in the area. (The rural 160th Street turns into South Twelfth Avenue in Rock Rapids.) The council decided that they would proceed with that project from the city limits, east toward Tama Street, in lieu of seal-coating that street this year. Council members said it would be a “test” of micro-surfacing, which they have not done before. New estimates were that it would cost more than was first estimated. The old estimate was $32,000. The new one is $44,000. City council members also voted to approve general obligation capital loan notes in an amount not to exceed $2.15 million to help with the financing of several infrastructure projects. These projects include construction on the North Union Street Bridge (underway now), South Second Avenue West (2020-2021), South Bradley Street Extension (2021), Downtown Sidewalks (2020-2021), and downtown Marshall Street (2023). The funds will also be used to finance seal-coating projects (2019-2021), the “Interceptor Sanitary Sewer” project (2019), stormwater drainage tile (2019-2020), and sanitary sewer rehab work (2019-2022). The council also set the date of a public hearing for removing a portion from Urban Renewal Area #1, and creating a new Urban Renewal Area #14 out of that portion. This is for the DGR expansion project. Finally, the city council accepted the emergency services agreement with the Lyon County Fair Board for providing rescue and fire services at the races this summer. Other county fire departments will also be doing this, with a rotating schedule determining which department is handling it for each week. Fire Chief and councilmember Ed Reck says the agreement is about the same as previous years’ agreements. According to George Fire Chief Bill Sprock, about 2:05 p.m., the George Fire Department was called to the report of a tractor on fire near 230th Street and Jefferson Avenue, a mile south and a mile west of George. The chief says the fire department saw the tractor fully engulfed as they approached the scene, with the stalk chopper that it had been pulling also on fire, along with about 20 acres of cornstalks. He says they used water and foam to fight the fire. He says they received assistance from an area farmer with a disk, which he says was a good thing, as the fire was headed toward two hog buildings when it was stopped. Sprock says no injuries were reported. He says the cause of the fire appeared to have been electrical in nature. Chief Sprock reports that the tractor was totaled in the blaze, but the newer stalk chopper was salvageable. He estimated the damage to be at least ten to twenty thousand dollars-worth. He says the fifteen firefighters who responded were on scene for about two hours. Then on Sunday night, Sprock says about 9:35 PM, the George Fire Department was called to the report of bales on fire at 2672 Jefferson Avenue, four miles south, one west and another half-mile south of George. The chief says the fire department saw burning cornstalk bales as they approached the scene. Sprock says that the old bales were being burned on purpose, but with the change in direction of the wind, the fire got out of hand. He says firefighters were able to limit the damage to only the cornstalk bales that were to be burned anyway. The fire department was assisted by the Boyden Fire Department, who brought water to the scene. Sprock reports that the 22 firefighters who responded were on scene for about three hours.